Replacement narrow / oblong blue standup (stationary) target. Used on late-model Bally and Williams games but can be used on older models and other makes/models as well. 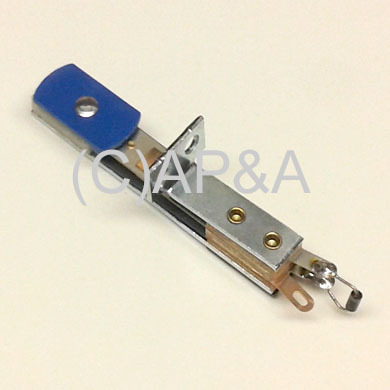 Includes mounting bracket and switch diode, as pictured. Front-mount target- mounting bracket is on front of target. Also replaces # B-12583-1. Target face is 1-inch tall. Requires two screws for mounting (not included- use our part # HWR02-030606). Wires must be connected with correct polarity- if installing in a late-model Bally or Williams game, green wire(s) will go to empty solder lug, and white wire(s) will connect to solder lug with diode's anode (non-banded) end.